Quality is the hallmark of our industry, to maintain tremendous quality standards we manufacture & supply a wide array of Pen Stands. This range is made of high quality material & thus widely appreciated amongst clients. These products are available in the market at industry leading prices. 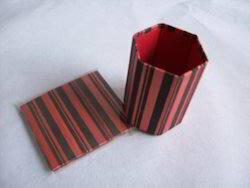 We are reckoned amongst the clients for offering a wide array of Stylish Pen Holders. These products are widely demanded by the clients for their beautiful prints and designs. The offered products are available in various sizes and embellishment that are able to grab the attention of the clients. Our products are made accordingly to meet the requirements of the clients. Moreover, they stand on rigorous quality standards set by the industry.